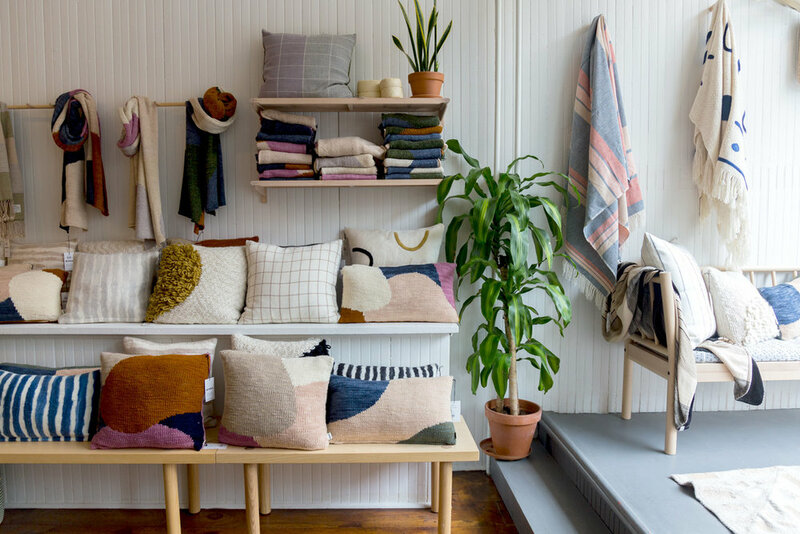 What led to your decision to open a storefront in Hudson, New York? I hadn't been planning on opening a store, really! I was toying with the idea and the space sort of fell into our lap. I had been living upstate already for about two years and knew that if we were to open a store, Hudson would be the ideal location. There is such a strong design and art community here and it felt like the place our brand and story would be well received. It's been really great to have face to face interactions with our customers now and allow them to experience the brand the way we want them to. What is the process of bringing a MINNA piece to life? It depends on what we're working on! Most designs start as either a sketch, a small swatch I wove, or a painting. Usually, I take that and then digitize it to send to the artisans or I bring swatches/drawings with me on our production trips. Depending on how the process goes, we make 1-3 rounds of samples before the final product is ready. Your story of being a graphic design student at SVA to opening a store is quite inspiring. What led to your decision to start your own line? After graduating from SVA I worked in digital design at small and large agencies. I had the opportunity to work with some pretty great clients, but overall, that sort of design environment wasn't for me. About 6 years ago, I quit my fulltime job to start freelancing and to give myself the space to think about what I really wanted to do. I sort of fell into weaving and the business evolved out of that interest. What initially sparked your interest in textiles? I was always really interested in materials. As a kid, I was always making things and my mom taught me to knit and crochet at a young age. I think I was more interested in the yarn than the actual knitting though. When I was freelancing, I decided I wanted to learn to weave and just taught myself. From there, I took a few classes to really learn the technique and read a lot of books about weaving. I was mostly working on frame looms at the time. I think the technique really appealed to me because it was so tactile and meditative, and allowed me to use my design background in a completely different way. How did you take your interest in weaving from a hobby to a career? The more I got into weaving, the more time I spent focusing my energy there. I was mostly making one-of-a-kind wall-hangings and started showing them at craft fairs. From there, I got some pretty exciting commissions and realized that I wanted to really try to make a textile business happen. I knew that making everything by myself wasn't going to be sustainable, so I started to look into artisan production. I think part of what I was missing in the design word was that my work didn't have a purpose. So, I wanted the new collection to be more than just beautiful, but meaningful and impactful. You’ve mentioned before that the collection is inspired by Feminist art, the Bauhaus, traditional craft, and vintage textiles. What are some of your other influences? Those are definitely the top four but I could be inspired by a song, a place, a smell, a weird pattern I saw forming on a brick wall, etc. I've always been infatuated with the Bahuas since learning about the period Freshman year of college. Even before I started MINNA, I was always collecting weird, found textiles and objects that inspired me. My favorite artists include Anni & Josef Albers, Sol Lewitt, Agnes Martin, Helen Frankenthaler, Georgia O'Keefe, Shiela Hicks, Marcel Dzama, I could continue! 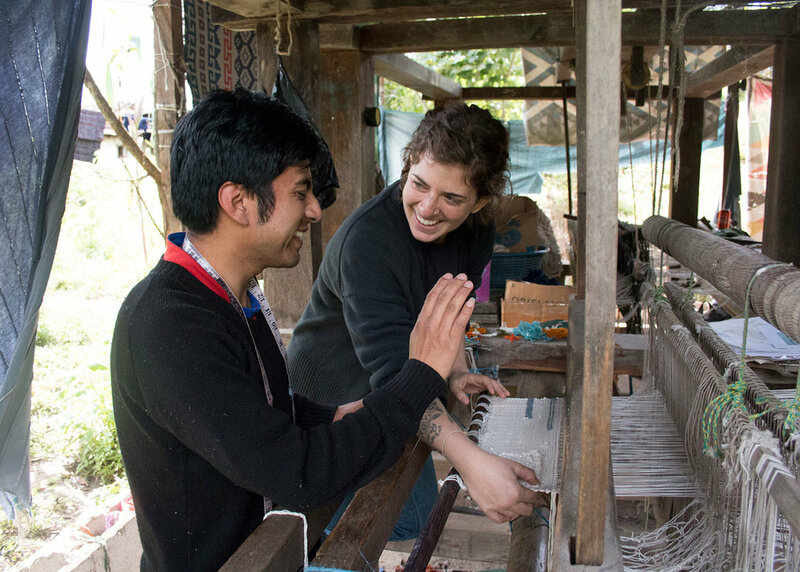 How did you establish relationships with artisans in Mexico, Guatemala, Uruguay and Bolivia? I met our first partners in Mexico when I traveled there. Both are small, family-run workshops and they've really become more like close friends. I visit them about twice a year and we're in pretty much constant communication. Everywhere else, we work with social enterprise organizations or NGOs to connect us with small artisan cooperatives and workshops. Our main goal with each collection is to create sustainable employment for our artisan partners. We want to develop long lasting relationships. We look for artisan groups and organizations that follow fair trade practices, include a training aspect whether it be general education or business development, and we always try to work with folks who are interested in innovation. While our designs aren't traditional, they are based on traditional techniques and having the interest to push what that means is important to us. Your maternal grandmother’s middle name is both that of your collection and store, a name she dropped upon arriving in the United States in 1940 from Germany. We’d love to hear more about this strong woman in your life. I've always had a really intense interest in learning about the Holocaust and what happened in Germany during WWII. Maybe that comes from growing up Jewish with grandparents who escaped, who knows. I always wanted to hear about my Omi and Opi's stories, even though I could tell it wasn't something they really didn't want to share. I actually only learned about the Minna name when I was doing a senior college project on her. She mentioned it so casually, "Oh, I dropped my middle name when I arrived at Ellis Island. My father was so angry! It was his mother's name!" I thought it was amazing - so rebellious, and so unlike the put together woman I grew up knowing. I think it made me see her differently, so I chose the name for my business! It has a story, but it isn't necessarily an obvious one. Any sneak peeks of what’s to come in the future for MINNA? We've been doing a lot of behind the scenes work this year. Streamlining our business practices, making sure we're saying the right things in the right way, building the team to be the best they can be. But in 2019 there will be tons of new things! We really expanded the kitchen category for Spring 19 and we're working away on getting a simple collection of bedding together too! Other than at MINNA, where do you enjoy spending time in Hudson? There are so many great places! We love getting dinner at Lil Deb's Oasis, drinks and a quick bite after work at Back Bar, lunch at Talbott & Arding. My favorite stores include Nina Z (amazing vintage and clogs!) and Likeminded Objects / Enkyu (jumpsuits and wild furniture!). I try to check out the openings at September Gallery as much as possible, too. Visit the MINNA store in Hudson, NY or contact your A/M Sales Associate to place an order!